A high-pitched call in early spring is heard from afar. An obtrusive väh-wäh-wäh – combination of calls can be heard after. A beautiful old mixed beech forest with several layers and plenty of dead wood is home of the Middle Spotted Woodpecker (Dendrocopos medius). A small hiking trail passes the ground at Langes Tal in the Western Hainich park area. The Middle Spotted Woodpecker is easily been seen in 5 meters height when it is calling. 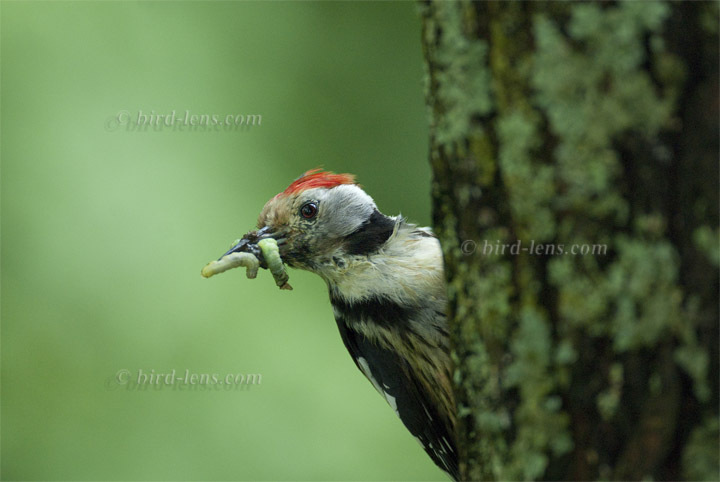 The Middle Spotted Woodpecker uses oak-dominated forest stands in the National Park. Beech dominated forest areas are only used when the beech trees are well over 140 years old or a high proportion of mixed tree species is available. Signs of woodpecker’s nesting holes can be seen afterwards. The area of the Hainich National Park in general is important for many other species of Picids, including Grey-headed (Picus canus), Lesser Spotted (Dendrocopos minor) and Black Woodpecker (Dryocopus martius) which are all quite common. Using the playback method, along transects, an annual scientific study counted Woodpeckers distribution and abundance. In the context of the point stop count all woodpecker species occurring in the national park were proven. The results show that, as expected, the most common species were Great Spotted Woodpecker (Dendrocopos major) (41 % on average per year), Grey-headed Woodpecker (20 %) and Middle Spotted Woodpecker (21%). These species were detected in each study year. The proportion of observations of these three species together was not below 70% in any year. The numbers suggest that these species find good habitat in the forests of the National Park. Fluctuations in the relative abundance of species are likely to reflect population fluctuations to the normal extent. The Black Woodpecker was documented in 10 out of 11 study years. The proportion of observations of this species averaged 9.6% per year, well below the proportions ​​for the first three species. These results are consistent with current inventory estimates. The Black Woodpecker is assumed to be present with 6-8 breeding pairs. Whether the very low proportion of coniferous trees in the national park (only about 4%) is a significant cause of the comparatively low frequency of the Black Woodpecker is to be assumed. But this needs to be investigated more closely. Lesser Spotted Woodpeckers (Dendrocopos minor) (6.1%) and Green Woodpeckers (Picus viridis) (2.4%) were not so regularly and frequently observed in the transects. The Eurasian Wryneck (Jynx torquilla) was only documented in a single year. The transects affect suitable, open habitat areas only in the margins of the national park for Green Woodpecker and Eurasian Wryneck. In the case of the Lesser Spotted Woodpeckers, the habitat conditions in the national park may not be optimal. The Lesser Spotted Woodpecker is considered as an indicator for a high proportion of deadwood and primary forest structures, which is present in the protected area only in smaller areas so far. The average amount of deadwood in the national park across all forest areas is still comparatively low. A major threat to the Middle Spotted Woodpecker is the cutting of large oak trees (usually older than 80-100 years) on which the species depends for foraging and nesting. 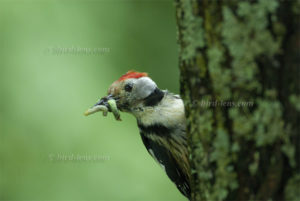 Tree logging in the forests of some eastern European countries have already affected populations of the Woodpecker. To cope with the growing demand for top shots of the rarer species of the Palearctic Bird-Lens is keen to enrich the range of pictures of birds you can find in the western palearctic. Trips to remote places like this one to capture images not only of rare birds of western palearctic were very successful. The nice image of the blog is only a first impression, what you will find in the gallery in the “Picture Shop” very soon. Just give bird-lens.com a message, if bird-lens.com could serve you with an image needed before the new pictures are online.